Our wine expert visits the vineyard to check the status of grape maturation and collect samples to send to the laboratory for analysis. The grapes have ripened and contain the correct ratio of acidity to sugars. 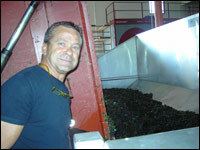 Moreno Musaragno personally check the quality of the grapes. Harvesting has begun. Part of the grapes are collected by hand as part of a select harvest, while the rest are picked by mechanical means. The filled truck arrives in the cellar and unloads the grapes into a large tank: the vat. 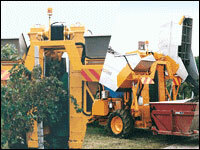 This is directly connected to the gleaner that separates grapes from their stalks. From this point, production operations proceed differently for white and red grapes.